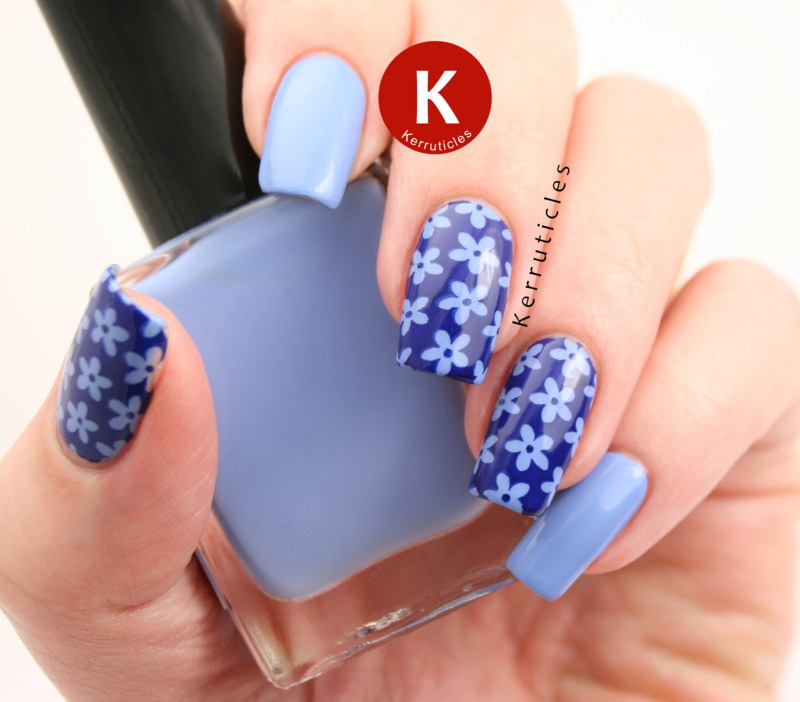 Here’s a blue daisies stamping manicure using one of the new extra large plates from Bundle Monster. BM-XL05 is one of the extra large plates released by Bundle Monster in February of this year. They’re not new images, but are old ones – the most popular ones apparently – resized as XL images. That’s great news for me. When I first started stamping, the first set of Bundle Monster plates was fine for my nails. 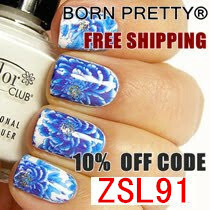 But my nails have gradually got longer over the past couple of years, and I now definitely need XL designs to stamp with. The Bundle Monster plates are rectangular, about the same size as the MoYou London plates and Born Pretty Store rectangular stamping plates. 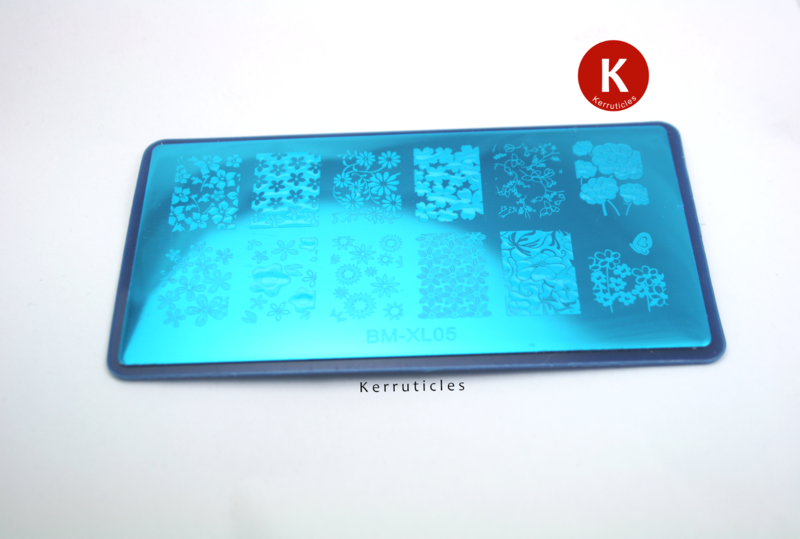 They are backed with navy plastic and come packaged with the blue protective film. On top of that, they are then wrapped in a plastic wrapper, like a greetings card wrapper. I’ve used the daisies image that can also be found on BM16. The original of this is way too small for my nails now. In fact the whole first Bundle Monster set is too small. So it was wonderful to be able to use it again! The blue base colour for this is Nail Geek Clear Skies, which I will post a fuller review of soon. The stamping is done using Mundo de Uñas Blue Navy (no. 3). These XL plates cost $3.99 each from Bundle Monster, or you can buy them in sets of ten plates (there are 3 sets) for $29.99 per set. 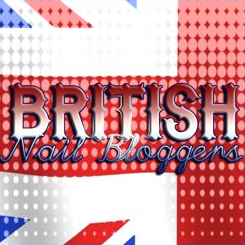 Nail Geek Clear Skies and Bundle Monster plate BM-XL05 were sent to me for review. All views expressed in this post are my own, honest and unbiased opinions. I love this Hun. Totally wearable too. I appreciate SO much your taking the time to find the images on the original plates. I’m a flower image girl…now I can easily pull out the plates and decide if I need the XL version. This is a beautiful mani! Thank you!